19 balls, 14 dot balls, wickets of Chris Lynn, Nitish Rana and Robin Uthappa in successive overs – Deepak Chahar rattled the KKR top-order and sealed the match for CSK in his opening spell in the Power Play. The seamer finished with figures of 3-20 in his 4 overs – his second three-wicket spell in IPL cricket. KKR could only muster a paltry 108 for 9 and CSK reached home for a seven-wicket win with 16 deliveries to spare. Chahar trapped the dangerous Lynn leg before wicket off the last delivery of his first over. He then induced Rana into a pull shot but the ball skidded on to the bat and kept a tad low with the batsman only managing to toe-end it to mid-wicket. Uthappa counter-attacked with two authoritative boundaries off the first two deliveries of Chahar’s third over. But the seamer had the last laugh getting the better of Uthappa with a slower bouncer which the right-hander, going for the pull, could only mistime to deep square-leg. Chahar had prized out three in-form KKR batsmen who all perished to cross-batted shots. KKR could never recover from this initial strike by Chahar. Harbhajan Singh and later Imran Tahir continued to build pressure and pick wickets in the middle overs. KKR could never develop any momentum and build any meaningful partnerships. Chahar returned to bowl the 19th over of the innings to Andre Russell – the batsman of the tournament who had a monstrous strike rate of 268.33 in this IPL before the start of the match. Dot ball, Dot ball, slog mistimed six, Dot ball, Dot ball, Dot ball. Chahar had remarkably bowled 5 dot balls to Russell at the death. Yes, the slow spinner-friendly Chepauk wicket and the fact that Russell wanted to keep strike did play their part. But with the West Indian in the mood he has been in the tournament, it was still a splendid effort by the fast bowler. KKR did manage to cross 100 – courtesy a fifty by Russell - but the writing was already on the wall. It was Chahar’s spell in the Power Play which dictated the course of the KKR innings and the match. They could not recover from the initial setback and were never in the game. 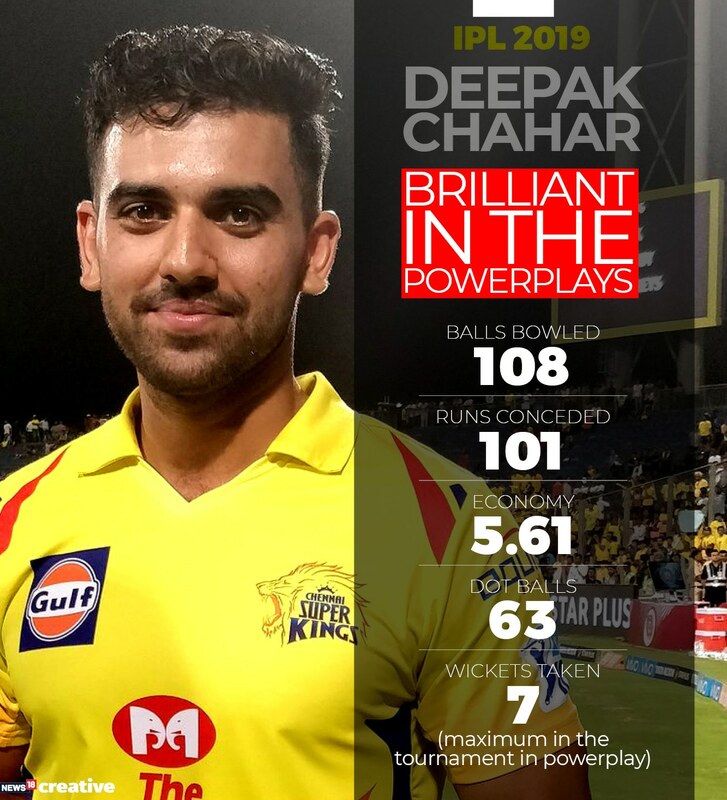 Chahar has been brilliant with the new ball in the first 6 overs for CSK in IPL 2019. Not only has he picked seven wickets in this phase of play in the tournament – the maximum by any bowler - he has also been phenomenally restrictive. He has bowled 108 deliveries and conceded just 101 runs at an incredible economy rate of only 5.61. He has bowled as many as 63 dot balls in this phase of play, i.e 58.33% of his deliveries haven’t been scored of in the Power Play. 0-17, 1-20, 2-19, 1-21 (3 overs), 1-40 and 3-20 – Chahar has taken 8 wickets (7 in the powerplay) in six innings at an average of 17.12 and strike rate of 17.2. He has been very restrictive too with an economy of 5.95. Chahar had a good season for CSK last year too picking 10 wickets in 12 innings at an economy of 7.28. He has an impressive overall T20 record having picked 50 wickets in 47 innings at 23.88 a piece at an economy rate of 7.28. Chahar has also represented India in one ODI (against Afghanistan) and one T20I (against England), both in 2018. While Tahir and Harbhajan have taken most of the limelight and credit for CSK’s stupendous bowling so far this season, there is another unsung hero quietly doing his job, day in and day out, with the new ball for the men in yellow. He has done his bit to ensure that CSK sit pretty at the top of the table.